Are You Looking For A Good New or Used Press Brake Machine? We have dozens of Press Brakes for sale in stock. Is the safest, and most expensive. They are generally slower and have more of a precise bend. 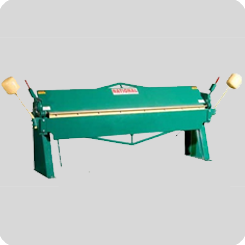 Hydraulic Press Brakes have a better control when inching down and setting up for your bend, they also can return to the top at any time. Hydra-Mechanical Press Brakes Rotary hydraulic cylinder turns the eccentric shaft by means of rigid mechanical linkage to both ends of the ram, distributing power equally over its full length. This basic power principle offers the operational control and safety of the hydraulic principle plus the rigid ram alignment, accuracy and operating speeds of the mechanical press brakes. With a Hydra-Mechanical press brake design the operator is in full command of the job. He can meter out just the right amount of fluid to move the ram the exact distance needed. With a Hydra-mechanical press brake you can easily inch the ram down for scribed line work, and easily locate the stroke bottom for setting up. This gives more accuracy, less operating time, and less training is needed. The Hydra-mechanical advantage allows you to instantly stop or start anywhere in the cycle, and allow reversal of stroke direction at any position. Different from a mechanical press brake that can only return the ram to the top after the cycle is complete. CNC press brakes are the latest in manufacturing. They can have multiple axis Backgauges, and you can program them to do different bends. This is the most expensive and the best for production. That should give you a basic rundown on how to purchase a press brake. 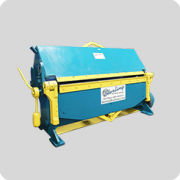 In a box-and-pan brake, the clamping bar includes several removable blocks, which may be removed and rearranged to permit bending of restricted areas of a piece of sheet metal or of already partially formed pieces. After bending, a box or pan form is then completed by screw, solder, weld, rivet, or other metal fixing process. New and Used Electric Brake Presses for Sale From 8 Ton - 1,000 Tons. Buy, Sell, Trade | CNC Electric Servo Press Brake with Brands Like Cincinnati, Accurpress, Amada, Pacific, Niagara, US Industrial, Primeline, and more. In Business Since 1954! When looking for a used Press Brake, or Brake Press, you need to know what type of press you are looking for. Press brakes come in all sizes and with many different options. There are many popular brands such as Cincinnati, Niagara, Chicago, Wysong, Amada just to name a few. We are the ONLY DEMONSTRATION AND NEW CINCINNATI SALES FACILITY IN THE WORLD! This new technology uses servos to power the ram. This allows for a super high repeatability of ±0.0002” with repeatability day in and day out. It is completely electric and when it is between moves it is silent. The Goform is the perfect solution for small parts up to 1/4” thick and weigh less than 50 lbs. 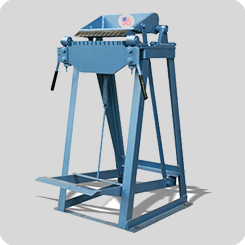 It is a small low profile machine that is built ergonomically for a user to comfortably sit or stand at the machine. The Cincinnati Goform Electric Press Brake has a electro-mechanical drive with satellite roller screws. This machine also has one of the largest strokes available with a 10” stroke and 17” open height compared to only 4” with other competitors brakes.Tooling, Tooling, Tooling, one of the best things about this brake is its adaptability of the tooling you are able to run with it. US Tooling, US self seating, Wila, Trumpf and European is all acceptable tooling for the Goform.The backgauge is a TRUE 6-axis gauge that moves at a incredible speed of 3,000 IPM. The Goform is also designed to be movable using a forklift to allow for easy work flow. 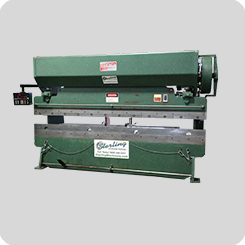 The Cincinnati Baseform comes with all the basic options and is increasingly the fastest growing brake on the market today, is the Cincinnati Baseform CNC Press Brake. This brake has a very competitive price structure compared to other manufacturers in the New CNC Press Brake Marketplace, such as Accurpress, JMT, Trumpf, Amada, Pacific and other similar high quality CNC Machines. It has accuracy repeatability of ± 0.0004”. Baseform is a production machine with limited customizable options opposed to a Proform, Maxform, Autoform or Goform. Baseform comes with a 3 axis or 4 axis CNC Cincinnati Touchscreen control, which is the same control across the board on the Cincinnati CNC Press Brake line. 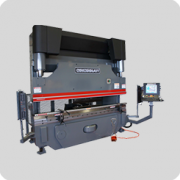 This makes it easier to step into other Cincinnati press brakes as your machinery needs increase, to a machine with larger stroke or other CNC capabilities. Another great option for your older Cincinnati brakes, is that you can upgrade your existing 1990’s CBII, FMII or AF to the same control and have 100% commonality of controls including tool libraries and program files. 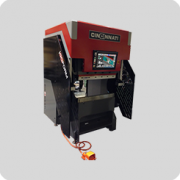 The Cincinnati Proform+ is one of Cincinnati’s most popular machine on the market today. It is a heavy duty general purpose machine to get the job done quickly and accurately! The Proform+ can be customized to include extra stroke, special horns for the aircraft industry and up to a 8 axis CNC Control. Also optional on the Proform+ is auto crowning, power clamping, multiple tool options to accommodate USA, European, Wila and Wilson Tooling. All with a repeatability of ±0.0004”. 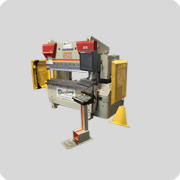 The most customizable CNC press brake made by Cincinnati Inc. is a Cincinnati Autoform+. Cincinnati Inc. can install Special Horns on the machine for aircraft industry forming or other special forming and punching operations. Also included in the Autoform+ is Standard DTC (Dynamic Thickness Compensation which allows the brake to automatically measure the thickness of the material as it is bending to calculate the changes in reversal for air bending). Autoform+ that has ±0.0004” repeatability rate. How long of a Stroke do you need? Just let us know and Cincinnati can build to order. If you are looking for a Tandem Press Brake for long pieces Autoform+ is your best choice! If you are looking for even more capabilities by way of ultra high speed as well as repeatability ±0.0002”, please inquire about a MaxForm Cincinnati Press Brake. Cincinnati Maxform Press Brakes can be customized to accomodate larger stroke, auto crowning, hydraulic clamping, standard DTC (Dynamic Thickness Compensation which allows the brake to automatically measure the thickness of the material as it is bending to calculate the changes in reversal for air bending), Heavy Duty Backgauges and more! It comes standard with a 5-axis gauge with optional 6-axis linear motor drive gauge allowing for the fastest CNC system on the market!